This webpage includes instructions and helpful resources for compiling the wolfSSL embedded SSL/TLS library and example projects in Visual Studio on Windows. 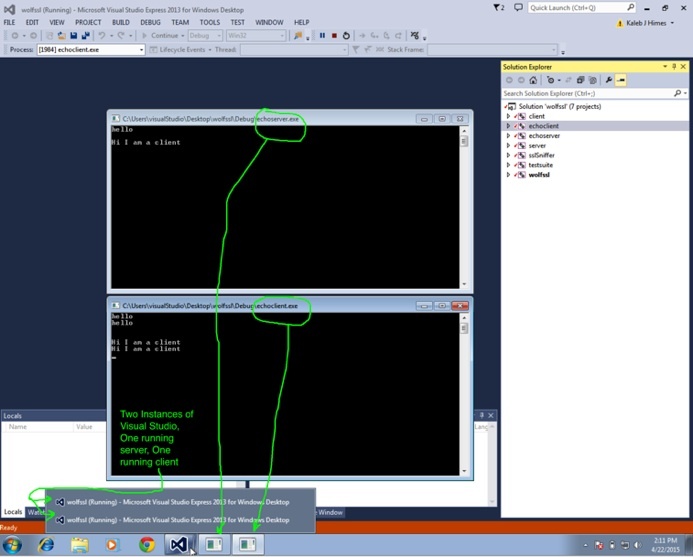 It also covers compiling wolfSSL as a DLL in Visual Studio. Navigate to the directory where you downloaded wolfSSL (“Desktop” above) and find the wolfssl directory, double click it. Next a window will open asking if you would like to overwrite the property sheets. 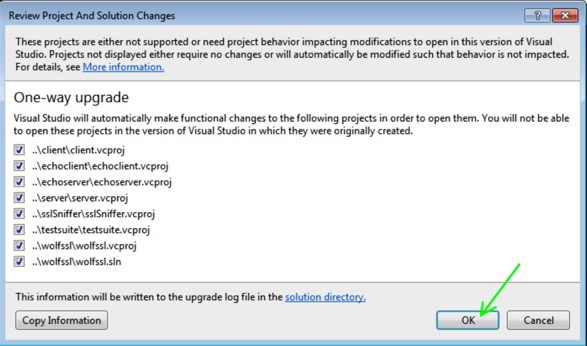 If using Visual Studio 2013 or later hit “Yes”. 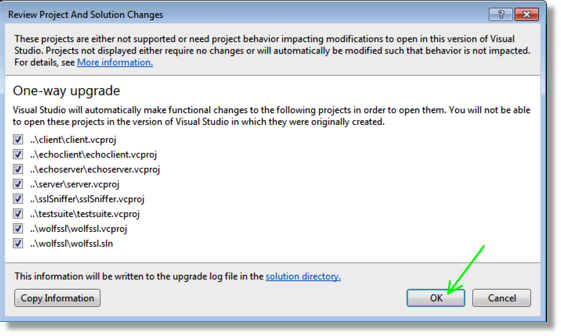 If using VS 2008 – 2012 you can opt to hit “No”. The only difference is you will see warnings if you overwrite the existing property sheet in regards to “SAFESEH” and “EDITANDCONTINUE”. They can be ignored. After this, a browser will open with information about the import that just took place. Review any changes you want and then close the browser window. Click “OK” at the dialogue in Visual studio. You should now see a black terminal window open with nothing in it. This is the server waiting for a client to send it a message. You will see the client receive a message from the server and then both terminal windows will close. 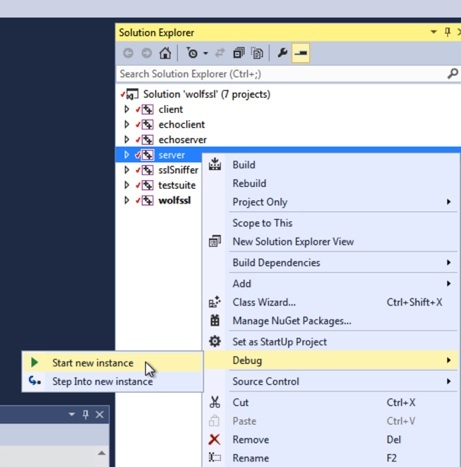 In the other Visual Studio instance right-click “echoclient” and “Debug ? Start New Instance”. In the client terminal type a message and hit Enter. The echo server should “echo” the message back to you. Type “quit” and hit enter to send the shutdown signal to the echoserver and both terminal windows will close. The following has been tested in VS2012, VS2013, and most recently VS2015 Community Edition. Follow the instructions as in Part 1 to obtain wolfSSL from GitHub or a stable release from the wolfSSL website. 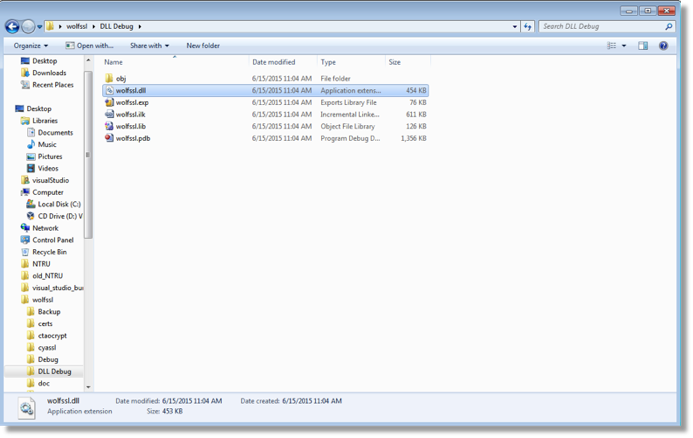 Navigate to your download location (ex: Desktop) and find wolfssl directory, double click it. Next You will see a window asking if you want to overwrite the project and its imported property sheets. DO NOT select yes. If you do, just delete the wolfssl directory on your desktop and start over by re-cloning, re-unzipping, or re-downloading the project from github. Select No and check the “Do this for all similar cases…” box. Review any changes you want and then close the browser window that opens. 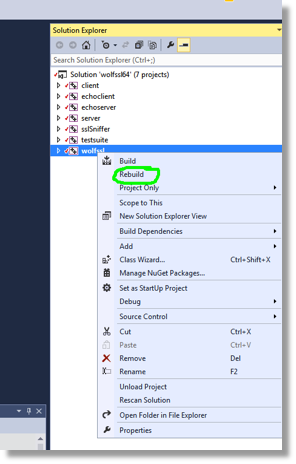 Click “OK” on the dialogue in Visual studio. 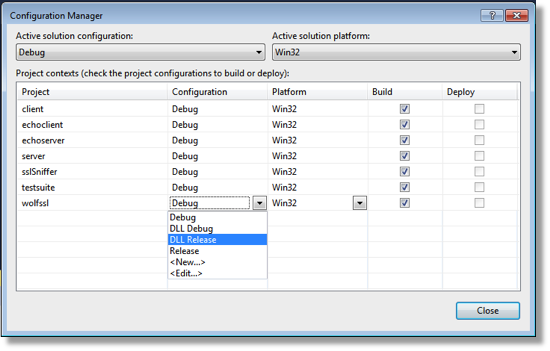 Select which projects you would like to generate a DLL for.